Entering Hartford Theological Seminary in early September 1935, I was treated kindly by the dean and registrar and received with courtesy by the students I met upon arrival. The campus impressed me. The granite buildings rising in Gothic splendor, the green lawns, and the tree-shaded courtyards betokened serenity and peace as well as opulence and refinement. I was assigned to a private, well-furnished room in Hosmer Hall, from which I could look out on the campus and in which I soon made myself at home. I have entirely forgotten what I paid for room, board, and tuition. I only know that the money from the fellowship left me without financial worries and enabled me to devote myself without care to my various studies. I was disappointed to learn that Prof. Farmer had left Hartford for Oxford, and I found that his replacement, Dr. Johanson, was hardly a match for his predecessor, nor indeed for Prof. Berkhof. But Johanson now occupied the chair of systematic theology, and I took two courses under him during the first semester. One of these, predominantly a lecture course, was on “the Modern Development of Religious Thought.” In it the professor gave expression to the vapid theological liberalism that, I soon realized, reflected the dominant spirit of the school. I had grown skeptical of some features of the Reformed faith while at Calvin, but the shallowness of the “modernist” alternative as expounded here turned me around and deepened my appreciation of my orthodox heritage. Nor did I hesitate to give expression to it in class discussions. I was happy, though, to be introduced during that semester to such theologians as Paul Tillich, Reinhold Niebuhr, Rudolf Otto, William Pauck, and others, and I spent a considerable time reading them. The other course I took with Prof. Johanson was a “Tutorial in Systematic Theology,” in which I was free to conduct my own researches and obliged only to periodically present papers embodying the results of my investigations. It was here that I fell upon Karl Barth. There was a German exchange student at the school by the name of Wilhelm Vauth, and we soon became fast friends. It was he who put into my hands a copy of Theologische Existenz Heute, the magazine Barth published in collaboration with Brunner, Thurneysen, and others. When I read what Barth had to say, my spirits rose. I sensed that here was a man who, affirming a transcendent God and a veritable supernatural revelation, expressed my own deepest sentiments and afforded me a contemporary reference point from which to engage my mentors and fellow students in relevant discussion. During that year I went on to read in Barth’s Rmerbrief and in his Dogmatics, and also in Schleiermacher’s Christian Faith. Before the semester ended, I presented to Prof. Johanson a lengthy paper entitled “The Doctrine of Revelation in Barthian Theology.” I can fairly say that it was Karl Barth who, even in his Kierkegaardian existentialist phase, helped to establish me more firmly in the Reformed faith. In addition to my work with Prof. Johanson, I took a course on “The Inner Life of Jesus” with Dr. Purdy, the professor of New Testament. I wrote a paper for him on “Jesus’ Messianic Consciousness” and another titled “Why Jesus Had To Be Baptized.” Prof. Purdy was a scholarly and mild-mannered man who held the biblical witness in deep respect and who, I’m happy to say, found my presentation suited to his own opinions. That semester I was also privileged to take a seminar in Spinoza with the redoubtable Prof. Mackenzie, the retired professor of systematic theology. A small group of us met in his house weekly, and because I was thought to be somewhat schooled in philosophy, I was asked to prepare a disproportionate number of papers for class discussion. We did not get far into the Spinozan text, but under Mackenzie’s tutelage the outlines of the philosopher’s thought were laid bare, and this was a gain. It was not all study during this semester, of course. I wrote Hilda at least twice a week; I corresponded regularly with family and friends; and I played Ping-Pong frequently. There were also bull sessions in the dorm and informative meetings with Wilhelm Vauth about German theology, particularly about Bonhoeffer, Althaus, and Barth. Food was served with grace in the elegantly appointed dining room, where we sat in intimate groups around small tables and were served by student waiters and waitresses under the watchful eye of the dining room matron. After dinner there was dancing in the foyer, and I was induced at last to join in the festivities; but my heart was not in it, and I never really acquired either the art or the habit of dancing. During the Christmas break I returned to Grand Rapids, and, since Wilhelm was alone in a strange country, I persuaded him to accompany me home. We stayed at Mart and Therese’s, where Mother also resided, and we spent a leisurely two weeks exploring the town. We even made a trip to Chicago, where Wilhelm met several members of my family. Naturally, I saw Hilda often, and the three of us went out frequently. During this vacation period I preached one English and one Dutch sermon at Coldbrook, Hilda’s home church. Nothing interrupted my labors that semester except the flood that inundated midtown Hartford in the spring of 1936. Several of us seminary students were recruited to help in the relief work, and quite a number of us spent several days helping refugees flee from the rising waters. During that rescue operation three or four of us were put up by a wealthy resident in his palatial home and treated royally with sumptuous dinners, soft beds, and maid service. Another thing I remember is winning the table tennis tournament near school’s end. This led to my learning a bit about Oriental culture. A finalist in the tournament was a student from China. On the day following our match, he presented me with a gift that I greatly admired for its beauty and antiquity. Some days later, however, a knowledgeable person informed me that I had been given an heirloom; I was not really expected to keep it, and in all courtesy I should return it to the giver. With appropriate apologies, I promptly did that, to the evident satisfaction of the donor. With Hilda’s approval and with the Institute’s assurance that she could accompany me, I accepted the appointment sometime in early June. I was informed on June 10 that the German authorities had honored my request and were assigning me to the University of Gottingen, my first choice. I had selected Gottingen because it was the only German university with an established chair in Reformed Theology, the chair Karl Barth had held before he left for Bonn and Basel. Under the circumstances, Hilda and I laid plans early on for a summer or fall wedding. Already on June 27, I forwarded Hilda’s health certificate to the foreign authorities and sent to the New York Institute a money order in payment of the premium on our two health insurance policies. We did not then know whether we could live on the cash stipend I would be receiving, but we determined to proceed nevertheless. We reasoned that we could borrow funds from friends or relatives if we needed additional monies. I brought my 150-page dissertation entitled “The Christian Idea of Revelation” to a close before the school term ended, and at the graduation exercises held on May 27, 1936, I was granted a master’s degree in theology. Thus ended my stay at Hartford. During my stay in Hartford, the world continued, of course, to move on. In 1935, Hitler added twelve 250-ton vessels to his submarine fleet; and he banned weddings between Jews and Aryans. In the spring of 1936 he occupied the Rhineland, and threw his weight in support of Franco in the then-erupting Spanish Civil War. At about the same time, President Thomas Masaryk of Czechoslovakia went into retirement and was succeeded by Eduard Benes; Ethiopia’s Haile Selassie was driven into exile; and in England the death of King George V led to the enthronement of the hapless and ill-fated Edward VIII. Of less consequence in 1935 was the retirement of Babe Ruth and the death in a plane crash of Will Rogers. Things were happening closer to home as well. 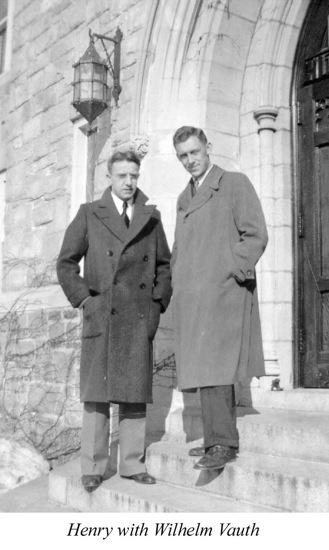 In March 1936, George Stob, my cousin, classmate, and close friend, was ordained to the gospel ministry in Sumas, Washington, and my buddy Leroy Vogel was finishing his studies at Princeton Seminary and contemplating going to Heidelberg. At the May 1936 meeting of Calvin’s Board of Trustees, Dr. Cornelius Van Til was appointed professor of philosophy to fill the vacancy left by the departure of Dr. Jellema; but early in June, Van Til wired the board “that [he] could not see his way clear to accept the appointment tendered [him].” The board thereupon decided “to reappoint Mr. Jesse De Boer for another year” and to postpone making a permanent appointment until the next annual meeting. At its June meeting the Synod of the Christian Reformed Church issued a warning against birth control; and on June 11, 1936, the Presbyterian Church of America (later the Orthodox Presbyterian Church) came into being. After attending the graduation exercises at the First Methodist Episcopal Church in Hartford in late May, I returned to Grand Rapids about the first of June for a visit with Hilda. We discussed the future, laid plans for the summer, and decided on a September wedding date. We determined that Hilda should continue working at Steketee’s and that I would return to Chicago to be near my mother and to find remunerative employment. Mother had spent the winter with Mart and Therese; but she had moved back to Cicero in the spring and now lived in a rented apartment at 1443 South 59th Court. The apartment was too small to accommodate the two of us, so I took up residence with Bill and Til as I had done in the past. Through the good offices of relatives, I found a job at Western Electric Company: I was paid eighteen dollars a week for breaking up old telephones with a hammer and casting their various metal parts into the several barrels that surrounded me. It did not escape my attention that at the age of fifteen I had earned the same pay at a less menial job. I did not see Hilda during the rest of June, but she did come to Chicago in early July, and she was introduced to my many relatives when she attended the Stob family picnic that was held on Independence Day. I had preached on three successive June Sundays in the Chicago area, but I determined thereafter to come to Grand Rapids and environs as often as I could. Fortunately, I was able to preach in English and Dutch at Beaverdam on July 12, in English at West Leonard and in Dutch at Eastern Avenue on July 19, and in Dutch at Coldbrook on July 26. On these occasions I was put up at Hilda’s house; but I had to leave on the midnight train in order to be back at work on Monday morning. In August I was able to travel to Grand Rapids only twice. I preached at Fulton, Illinois, on the second and at Cicero II on the ninth; but on August 16 I preached at LaGrave, and on August 30 at Allendale and Rusk. On August 21, an announcement of our forthcoming marriage, accompanied by a large photo of Hilda, appeared on the society page of the Grand Rapids Press, and on subsequent days a number of wedding showers for Hilda were given by Flora Ryskamp, Marie De Graaf, Hermine Weeber, and Nell Krombeen. I quit my job at Western Electric on September 4, 1936, preached at Roseland II in English and at Chicago I in Dutch on September 6, and, taking the midnight train, I arrived at Hilda’s house in Grand Rapids early on Monday morning, the seventh. The next four days were busy ones. Hilda had made a great start in gathering together the things we were to take with us abroad; but these and hitherto unthought of things had to be put in trunks and boxes and shipped by freight to the port of New York. These tasks occupied almost all of our time. When, on September 11, the day of our wedding dawned, our spirits were high, and I looked forward with joy to a perpetual union with the woman I loved. Hilda was engaged with her own preparations during the day, and I went to the neighborhood barber for a haircut and a shave. This was the first time I had been shaved by a barber, and it proved to be the last. I have never since been shaved by another. 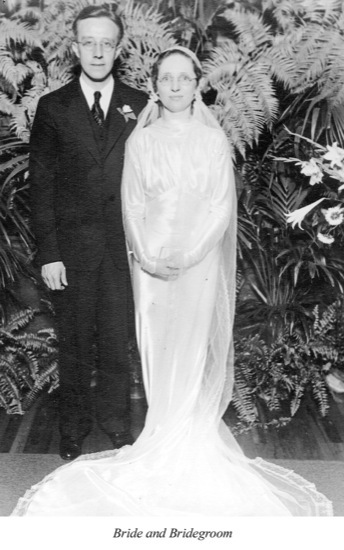 The wedding was held at 8:00 p.m. on Friday, September 11, 1936, in the East Leonard Christian Reformed Church, which was only a short distance from Hilda’s Leonard Street home. The congregation had been invited to witness the ceremony, and the church was packed. My mother and all my brothers and sisters with their spouses were, of course, in attendance, as were all of Hilda’s family and her many friends. Unfortunately, the weather that evening was not fair: a heavy rain fell as we entered the church, and the downpour remained unabated through most of the night. Hermine Weeber attended Hilda as her bridesmaid, and my good friend Henry Zylstra was my best man. John Daling and Hilda’s brother Andy served as ushers. When Hilda and her attendants were gathered in a side room for the adjustment of her gown and for other preparations, Hank Zylstra arrived with a briefcase in his hand. When asked what he carried, he inquired in return whether there was a men’s room in the building. When I said there indeed was such a room, we repaired thither, and he withdrew from his case a clothes brush for my grooming and then a pint of whisky, saying, “I thought we needed this.” I readily concurred, whereupon we toasted each other and went upstairs. Prof. Louis Berkhof had agreed to perform the wedding ceremony at a full-fledged worship service. There were the usual prayers and songs of praise, and also a sermon, whose text and contents I have forgotten. William Westberg was the soloist that evening. When Prof. Berkhof left the pulpit and came down to unite us in marriage, Hilda (as she later told me) wondered whether he had had a nip, but when we kissed, the secret was out. It should be said, though, that I suffered no reproach. A reception was held in the basement of the church for members of the family and about seventy invited guests. There was a program of sorts. Prof. Henry Ryskamp, my newly acquired brother-in-law, and his wife Flora, Hilda’s sister, were the master and mistress of ceremonies. There were toasts, a few speeches, and a child’s recitation by Ruth De Graaf, now Mrs. Lamont Dirkse. There was also much hugging and kissing between us and the family members we would soon be leaving. There were also gifts, of course, some money that we pocketed, and some household goods that we stored in the back room of Mr. De Graaf’s grocery store. When the festivities were drawing to a close, Hilda and I left in a borrowed car for Holland, Michigan. Hilda’s brother Clarence and his wife Marie had vacated their house on Black Lake for the night and made it available to us. I was twenty-eight years old at the time, and Hilda had just turned twenty-seven. We returned to Grand Rapids the very next day, Saturday, the twelfth, and re-established ourselves in Hilda’s parental home. On Sunday, the thirteenth, I preached twice in LaGrave Avenue Church. On Monday and Tuesday we packed our bags for the journey, and at noon on Wednesday, September 16, 1936, we entrained for the east coast. I should point out that the German Exchange Fellowship I had received did not cover our travel expenses. Just how we managed to pay for our boat and train tickets I do not remember. I know that Hilda had saved a hundred dollars out of her meager earnings, and that I had laid aside a slightly larger sum; but additional funds must have come to us from other sources. It is probable that my brother Tom paid for most or all of our boat fare. To finance our stay in Europe, we also borrowed five hundred dollars from Hilda’s uncle, David De Boer, at 5 percent interest; but this we kept in reserve under the management of Henry Ryskamp. In any case, when we left Grand Rapids we had our train and boat tickets in hand, and we carried in our wallets one hundred dollars in traveler’s checks, one hundred and fifty German marks (the equivalent of thirty-seven U. S. dollars), and $26.50 in cash. This, we judged, would hold us until the first German fellowship check arrived on the first of November. Considering the state of our finances, we did what then seemed expedient and prudent but was in fact a most unromantic and regretful thing: on this our first real honeymoon excursion, instead of taking a Pullman sleeper, we booked coach seats on the train and sat up the whole of an almost sleepless night. This was a mode of travel obviously unsuited to a new and beautiful bride. The train fare was $28.50. We stopped enroute and had breakfast in Allentown, Pennsylvania, with Prof. E. E. S. Johnson of Hartford, who had expressed a desire to see us before we embarked. He wished, it turned out, to give us last-minute instructions about Gottingen, and to bid us Godspeed. We arrived in New York City at 12:30 p.m. on Thursday, September 17, and went directly to the Hotel Pennsylvania, where a room had been reserved for us. While Hilda was resting, I procured a visa at the German consulate, and toward evening we ate dinner in a neighborhood restaurant; the bill was eighty-five cents. We went to bed early that night, for we were exhausted, and at mid-morning on the eighteenth we checked out of the hotel. The night’s lodging cost us the virtual king’s ransom of $5.75. My friend John Hamersma lived with his parents in nearby Ridgewood, New Jersey, and he had earlier invited us to spend the night at his house and be escorted by him the next morning to the Hoboken docks. We accepted his gracious invitation, boarded a bus on Friday afternoon, and arrived in Ridgewood in time to sit down to a hearty dinner. John and his fiance Helen took us out on the town that evening, and on the next day they drove us to the docks. We had booked passage on the Veendam, a Holland-American Line vessel, and the four of us boarded it about a half hour before it sailed. We had time to inspect our cabin, drink a toast to one another’s health and welfare, and express our fond farewells before all guests were ordered ashore and anchors were weighed. We broke from our moorings at 12:30 p.m. on Saturday, September 19, 1936, sailed past the Statue of Liberty, and moved out to sea on a voyage that would bring us eventually to Rotterdam, and to a new life on the continent of Europe. The Veendam was a very large ship, but on this sailing the passengers were few. There were only sixty of them aboard ,thirty-three in first class, fifteen in tourist class, and twelve in third class. Hilda and I were third-class passengers, but in spite of our low estate, we found the accommodations to our liking. Our cabin adequately met our needs, the food was excellent, and our fellow passengers were congenial even though not quite our type. 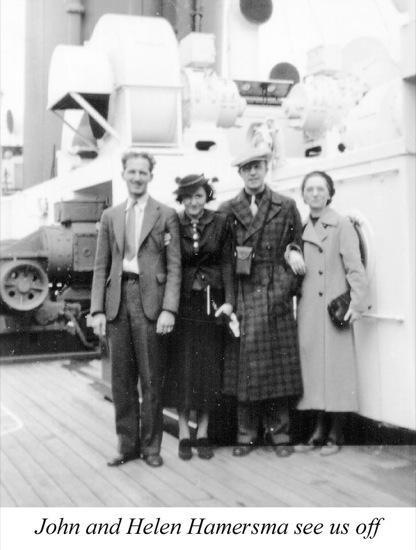 During the voyage we socialized very little: we were on our honeymoon and we relished our freedom and privacy. Life aboard ship was leisurely. We sat quietly on deck, played daily at Ping-Pong and shuffleboard, and read a good deal. We attended no festivities, visited no ballroom, and saw no movies. It was a time of rest and peace, yet spiced with anticipation and enticing prospects. Our expenditures aboard ship were slight. Modern travelers would find it hard to believe that after renting deck chairs, paying the orchestra assessment, and tipping the porter as well as the cabin, dining room, and deck stewards, and making purchases in the bar and commissary, our total expenditures came to $9.25. The round-trip boat tickets had cost $329.50. After nine days of sailing, the ship anchored in Plymouth Harbor, and on the next day, at 5:00 p.m. on September 29, 1936, we came to rest at Rotterdam. For us the academic year 1935-36 had come to an end, and an unknown future beckoned us.